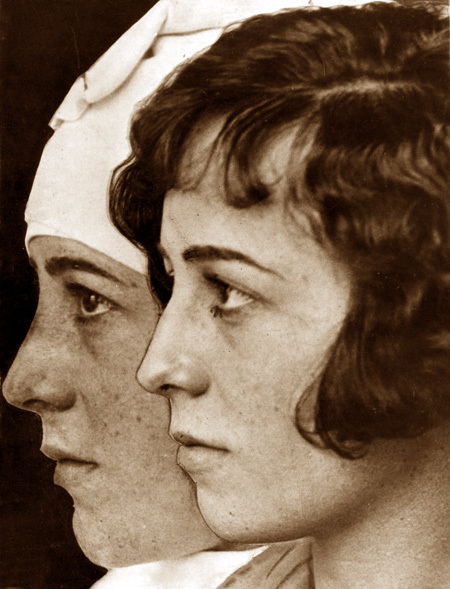 In 1925, hopeful starlet Lola Todd had the shape of her nose altered by Dr. William Balsinger, a famous Los Angeles surgeon of the time. 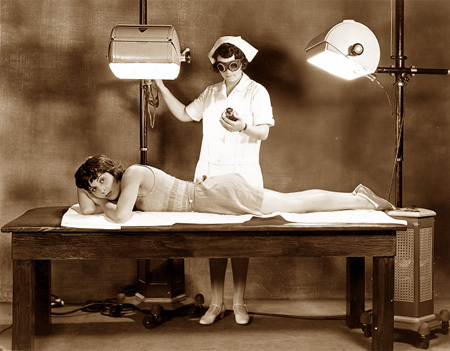 This was his sixtieth procedure for Hollywood patients, and in time cosmetic surgery would become commonplace in the film colony. Her nose looks fine to me either way, but (for the record) the “before” photo is on the right. The one on the left is how she looked after the procedure. The new honker didn’t do much for her career. She did land the second female lead in The Bells (1926) with Lionel Barrymore and Boris Karloff, but that’s the closest she’d come to a familiar role (at least for us eighty-odd years later). Her last known credits were in 1929. For an odd and obscure film called Diamond Handcuffs (1928), actress Lena Malena played three different roles, each of them named “Musa.” One of those Musas was part-black. Evidently M-G-M felt that make-up wouldn’t work, and a suntan would take too long, so the actress was given a “Raytan” treatment, above. The process began with a spray-on application followed by exposure to the rays of high-intensity lamps. The film didn’t make much of an impression and M-G-M quickly turned her loose, but within weeks she was at FBO, playing a Polynesian for Tropic Madness (1928). I wonder if she got another Raytan treatment for that role… or maybe the original one just lasted a really long time? Greta Garbo sings for her supper. So much of Greta Garbo’s life is tangled with rumor, gossip and half-truth that one hesitates to take anything at face value. But with her breakout hit Flesh and the Devil still in theaters, the new star was conspicuously out of the public eye in early 1927. There’s been conjecture that her tempestuous affair with John Gilbert may have produced a condition that was known in polite circles as a “delayed monthly cycle.” It’s rumored that the star was kept out of sight while she recovered from the then-illegal procedure that reversed the condition. But there’s another possibility, one that seems far more likely to me. The usually-reliable Photoplay announced that Garbo was suffering from anemia and intestinal flu at the time. In its issue for September of that year, on page 41, it was noted that her doctors had treated her with a special diet regimen. The diet consisted of fruits, vegetables, cod liver oil, and… certain meats. The meats included liver, kidneys, and brains. Brains! Photoplay let slip the only information we need. (Significantly, its editors carefully omitted the species of the organs in question.) The conclusion is inescapable that Garbo had died from her illness… but her powerful, panicked studio somehow had her brought back from the dead, only to find that its glamorous star was now a lurching, bloodthirsty zombie with an insatiable hunger for human flesh. Concealing the hideous, semi-devoured remains of her victims would have been no problem for M-G-M’s publicity department, accustomed as it was to quietly burying its stars’ indiscretions. 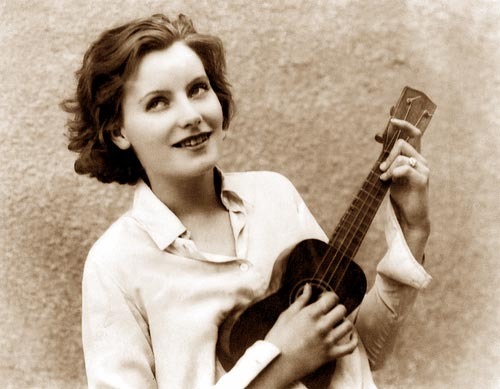 The only mystery is how Garbo was trained to keep her loathsome new impulses under control. But M-G-M’s resources were formidable, and evidently no expense was spared to make her as presentable as possible. And of course even in her undead state, Garbo remained a supremely talented actress, still able to convincingly portray glamorous (if curiously sullen) characterizations. Careful lighting and liberal applications of make-up perfected the illusion. Thus, she was able to resume her career— a career that would be noted for the star’s moodiness and occasional intractability— followed by a retirement in which she remained (or was kept) utterly isolated from the public eye.